Hi, my name is Julianne and I love coffee. It may or may not be a problem, but on Saturday I drank three pots of coffee. Granted, they were tiny pots (5 cups), but I will admit that that is a pretty weak excuse. So yesterday I decided to wean myself of my weekend diet of only coffee and on to something more suitable…coffee flavored cookies! And not just any cookies: shortbread cookies. Coffee flavored shortbread cookies. If I keep saying it over and over maybe you will realize how imperative it is that you stop reading this and get out your mixer. Go on…there you go. Combine the boiling water and espresso powder. Stir to dissolve and allow to cool to room temperature. Place the brown sugar and ½ cup water in a saucepan over medium heat. Swirl occasionally until the brown sugar has dissolved and bubbles on the edges. The mixture will smell burned, but you should let it heat for about 10 minutes. Add the 3 Tbsp of butter and whisk to dissolve. Pour out onto a piece of parchment paper and allow to cool. 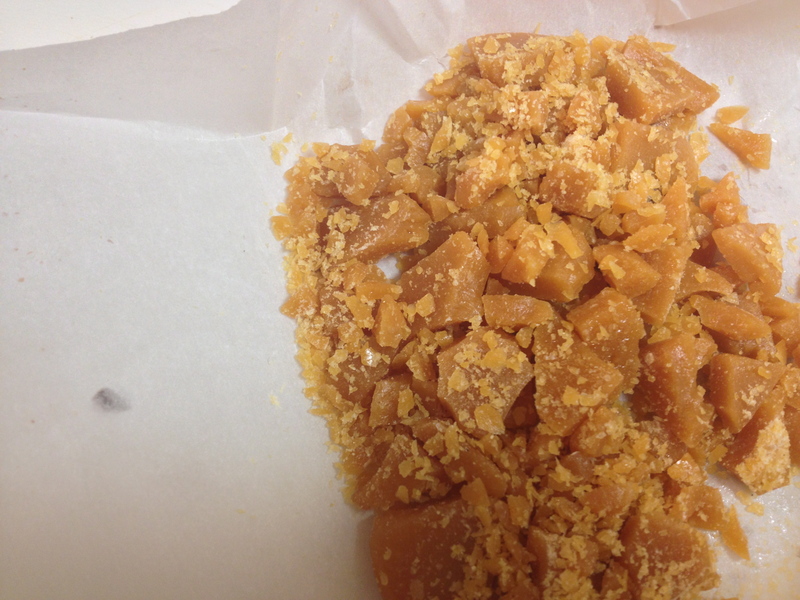 Once it has cooled, place the toffee into a plastic bag and use a mallet to break the sheet into small pieces. Cream the remaining 2 sticks of butter and sugar until smooth. Beat in the espresso, vanilla and salt. Gently beat in the flour. Fold in the toffee and chocolate. Place the dough in a gallon zipper locked bag, leaving the bag open. 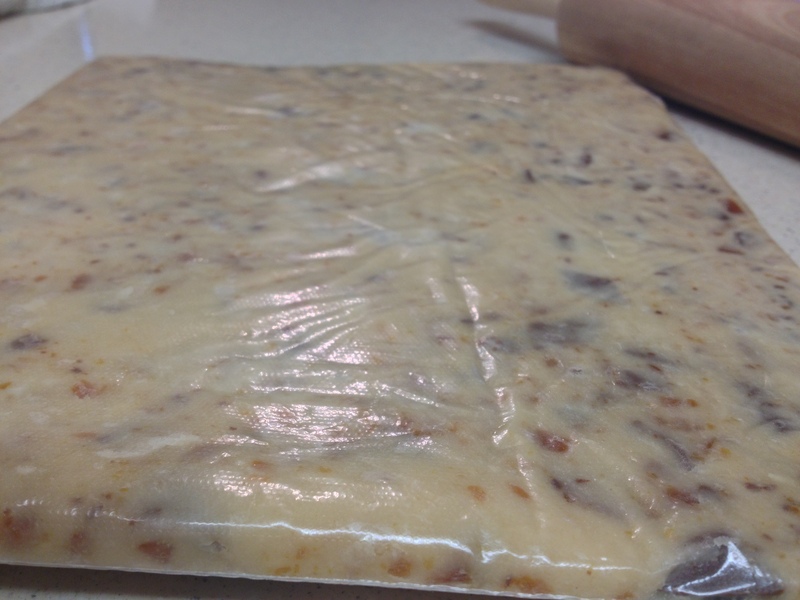 Using a rolling pin, roll the dough into the corners of the bag, until the dough is a flat square, about ½ inch thick. Slice the bag open and remove the now hardened dough. Place it onto a cutting board and cut the dough into small squares using a ruler and a sharp knife. 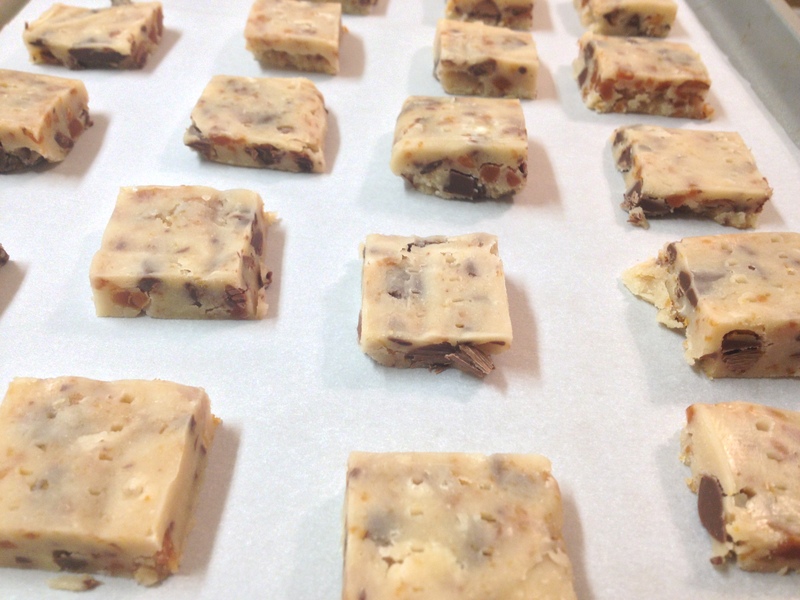 Bake the squares on parchment-lined cookie sheets for 15-20 minutes, rotating the sheets halfway through the baking cycle. 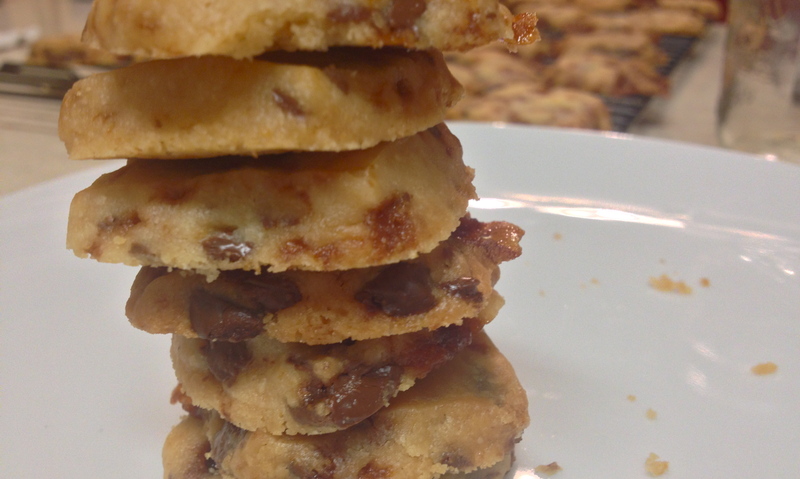 Allow the cookies to cool completely on a wire rack. They even improve with age (within reason, of course! ).